Every year, my sisters send great emails to family and friends so that everyone knows when their respective kids will be at camp, where to write and what is acceptable to send. This is a great idea because it gets the camper’s extended family engaged in letter-writing – without the typical confusion of having to figure out the camp address, guessing what the camp will allow etc and only remembering to write after the camper comes home. This letter is also the perfect place to let folks know if and how they can email the camper or send bunk notes (which often cost extra). Following is a sample letter, based on my Kate’s letter this year. 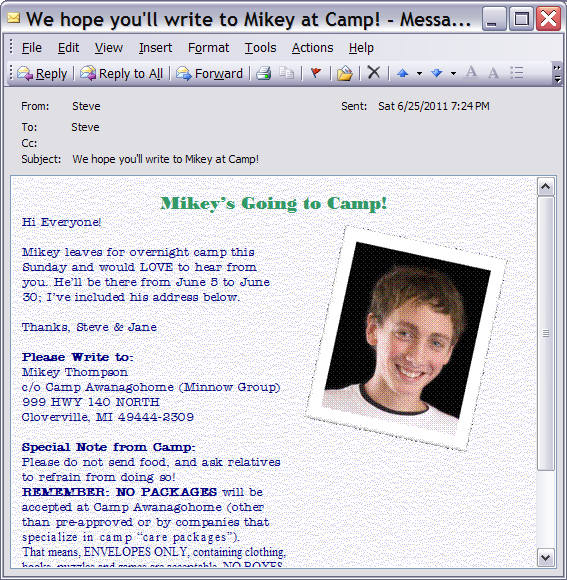 Mikey leaves for overnight camp this Sunday and would LOVE to hear from you. He’ll be there from June 5 to June 30; I’ve included his address below. Please do not send food, and ask relatives to refrain from doing so! REMEMBER: NO PACKAGES will be accepted at Camp Awanagohome (other than pre-approved or by companies that specialize in camp “care packages”). That means, ENVELOPES ONLY, containing clothing, books, puzzles and games are acceptable. NO BOXES and NO FOOD. If a food package does arrive from an uninformed relative, it will be returned or given away, not to campers.